We’ve had nearly 3 months now to reminisce and re-familiarise ourselves with David’s output, and in this time he has broken at least two records - total number of YouTube views in a single day, and number of albums by the same artist in both the top 10 and top 50 concurrently. While music and video stores celebrated his life with dedicated displays, I was surprised to find nothing of note in any of the London bookshops. Equally surprising has been the marked lack of new material - beyond magazines really and one great new book. I don’t really like to put my consumer behavioural science hat on in these circumstances, but the estate of David Bowie has a limited time to capitalise on society’s current mind-state and goodwill - a few weeks / months hence, David Bowie will not have the same cachet with the typical members of the public - retailers have to strike while the iron is hot. For such a fastidious musician and producer, I find it rather annoying that none of his live shows are available in high definition. Most of his filmography too is on DVD only, and a few of these are US region 1 only. Since the announcement of his passing, I have spent some time nearly every day getting back into the world of David - both musically and visually. I have watched hours of interviews on YouTube, as well as all the more obvious footage available. There could be a book on David’s musings and witticisms alone - and a video compilation of the same too. In amongst all the material, there is not really though a single package or vehicle which adequately conveys the depth and breadth of Bowie’s influence. I would love to see a Dorling Kindersley Visual Guide for David Bowie - chock-full of amazing infographics as well as the fantastic photographic material already available. In all my journeying I did not come across a single succinct guide which covered the essentials of Bowie in a single stream. Hence my intention with this piece is to gather together all my favourite parts such that those new to Bowie, or wishing to get to know Bowie better have a decent springboard to start off from. I never really saw Bowie as a proper album artist, for me, most of the albums lack coherent flow or theme and contain only a couple or so memorable tracks. 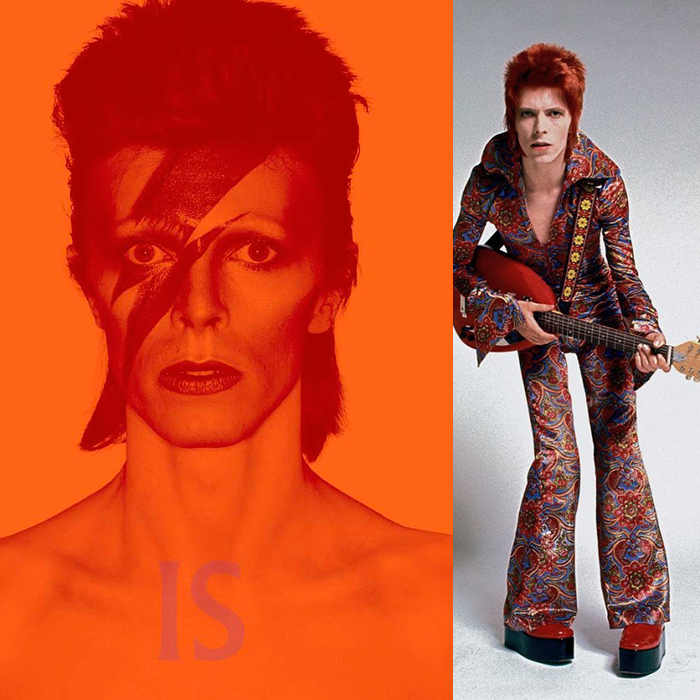 Most tend to agree that David Bowie made 3 truly great albums - Hunky Dory, The Rise and Fall of Ziggy Stardust and Low. 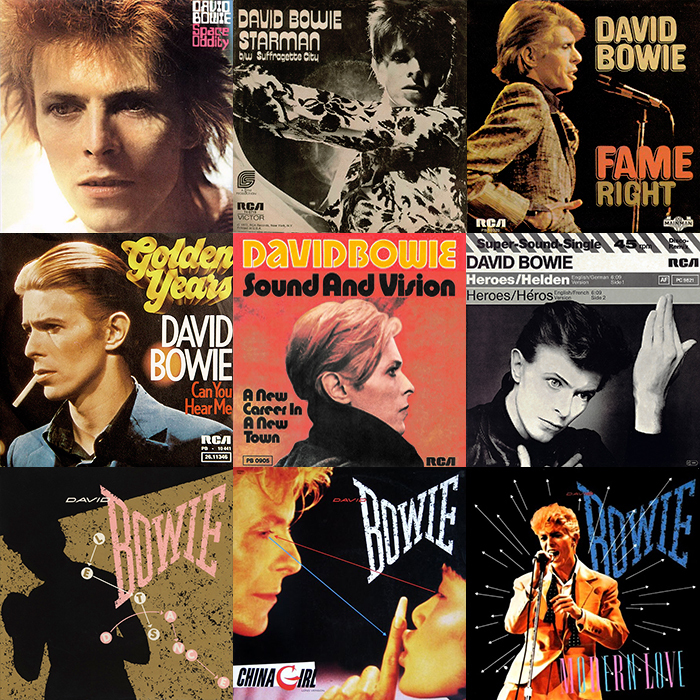 Then there is great argument over which are the best of the rest - I guess you can best group David’s albums into 4 categories - essentials, pretty good, flawed, and forgettable. A great example of a Bowie album is 1983’s Let’s Dance - which contains the highest concentration of great tracks for me - 4 of my favourites - Let’s Dance, China Girl, Modern Love and Cat People - the remaining half of the album is wholly forgettable though, it would have been better if all the great tracks were just on the one side, or even if this was just released as an EP. Some of the albums only contain 6 tracks and are little more than EPs themselves. Beyond the three absolute classics, I rather like Scary Monsters, and the latest one Blackstar. 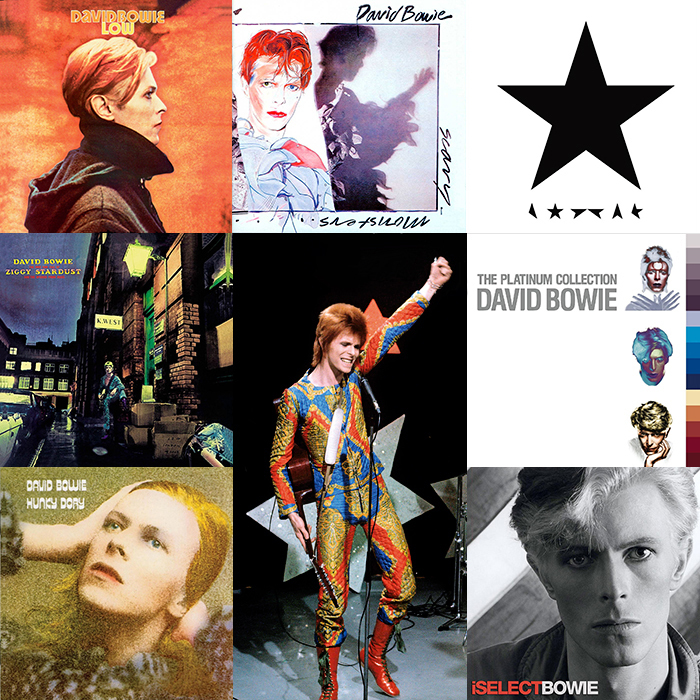 You can get all the other notable Bowie songs / singles via the triple Platinum Collection compilation. Another compilation - 2008’s ’iSelect’ largely contains a number of David’s lesser known songs - all selected by the great man himself. 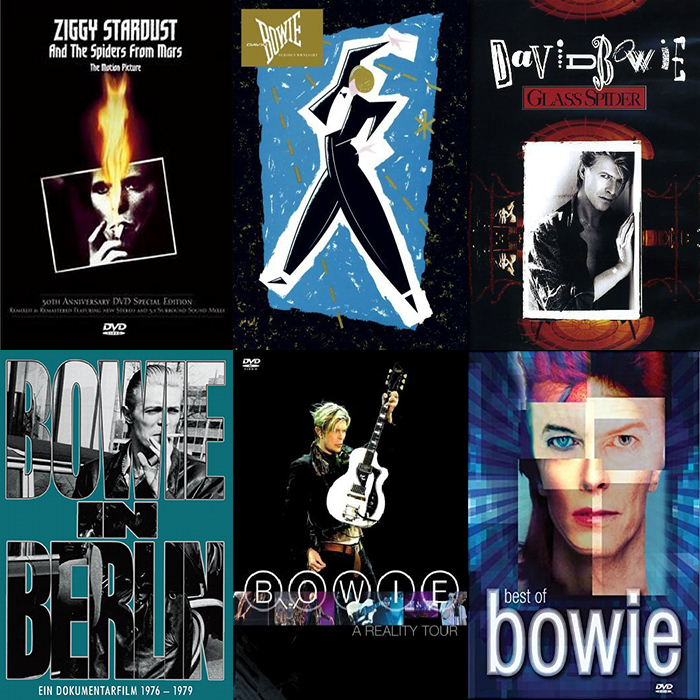 So in short - these 7 albums will give you pretty much all the significant parts of David’s music legacy - certainly in my opinion (bar a couple of tracks off ’The Next Day’). I had intially intended to limit the number of songs to 30, but ended up with 32. Sure I could have culled a couple, but after much deliberation I decided that these 32 best represented David’s oeuvre. 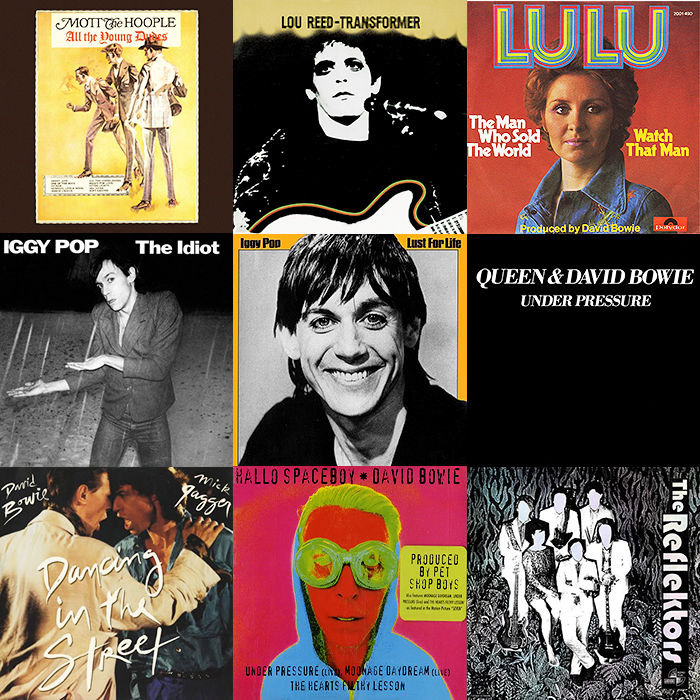 There are some album tracks and oddities in the mix - but in general you should recognise all of Bowie’s most memorable singles here too. I’ve already shared this one once before, but it’s so exceptional that I’m sharing it again. If you want a one hour snapshot of what made Bowie great, you really cannot do much better than this. In the Eighties we would have called this a megamix, but it is so much more than that - with individual tracks edited and remixed and segued together in the most incredible seamless fashion by the Dewaele Brothers / Soulwax / 2ManyDJs. The only tiny flaw for me is that it leaves out one of my all-time favourites ’Modern Love’, otherwise pretty flawless, not just the music either, but the video homage that goes with it. David Bowie biographies are two a penny, but there is only one fully detailed one, which is ’The Complete David Bowie’ indicated below. I thought that the V&A ’David Bowie Is’ coffee table book would take some beating, but ’The Rise of David Bowie’ kind of runs it neck-and-neck. 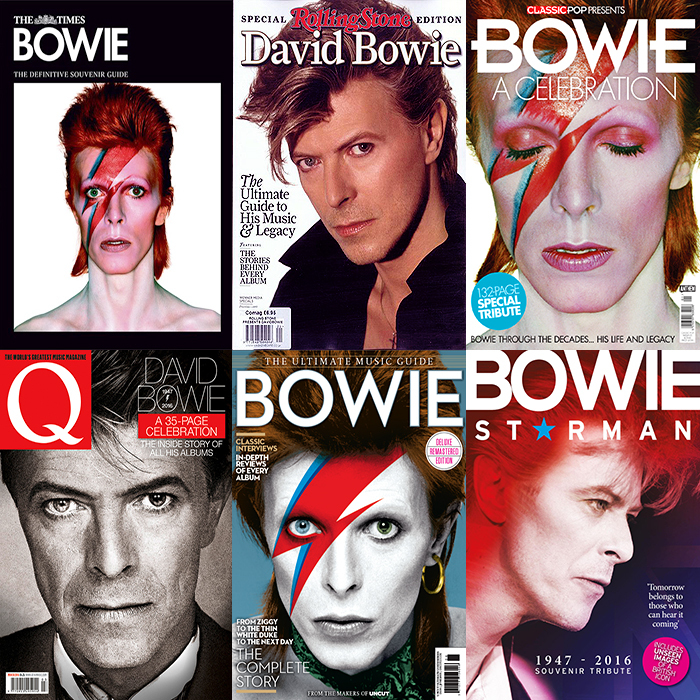 A number of the Bowie books need to be updated to include his final output. As I say in my introduction though, we could really do with a DK visual guide style book spanning all of David’s life and all his activities. No one really touches on his art as yet either. 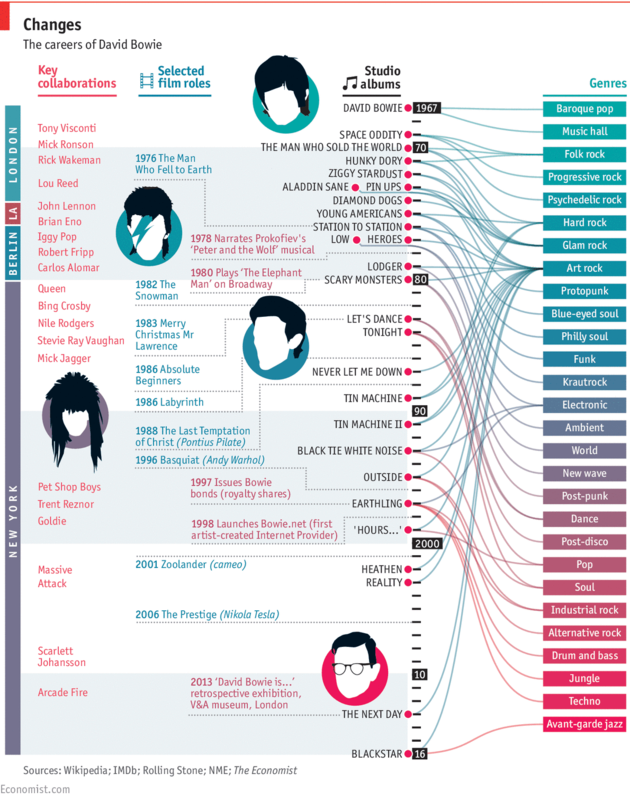 The above infographic from The Economist lists the musical directions / genres of David’s Albums in a fantastic informative chart. By far and away the best Bowie infographic I have seen to date, would love a whole book of Bowie infographics, and another one of musings and witticism as I have previously stated. Most of my generation remember David’s movie involvements best through his work with an army of muppets on 1986’s Labyrinth. The Man Who Fell to Earth is also notable, although I forget the number of times I have part-watched that film and never made it to the end. I think I’ve only seen it whole and complete on two occasions. David is not the greatest of actors - he usually just plays aspects of himself, and some of his output is rather forgettable. 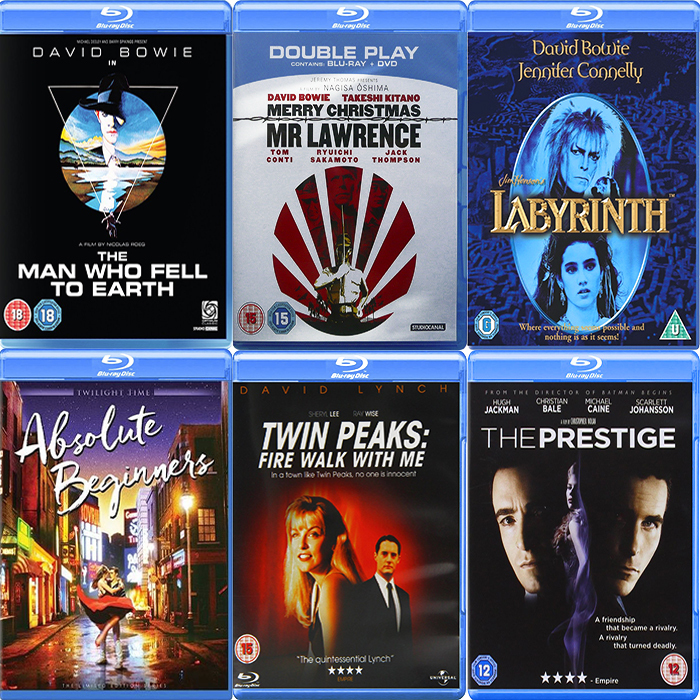 There are 7 blu-rays out featuring David Bowie, and I’ve include my 6 favourites in the above montage. This is my no means an exhaustive list, and I would have loved to have been able to pin down Region 2 versions of the somewhat hammy Spaghetti Western ’Gunslinger’s Revenge’ (1998 - as Jack Sikora) and rather ponderous dot.com.bust drama ’August’ (2008 - as Cyrus Ogilvie). Beyond the obvious - I think ’Into the Night’ is worth a look-in, as is ’The Hunger’ both films which David liked himself in. I am serously disappointed none of the musical videos are available as Blu-rays or high-definition. Surely some of these deserve digital clean-up and enhancement - like they did on the various Bond Movies. There are a number of dodgy documentaries out there, and Bowie in Berlin in my list isn’t exactly great, but it does feature my favourite ’Berlin Period’. The first one needs no introduction, and the others are they key live tour videos available - there is plenty of additional footage online. 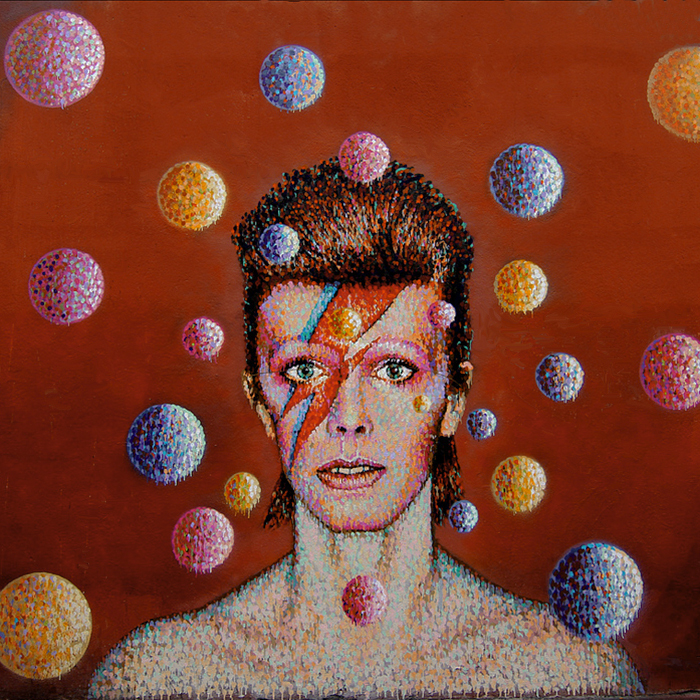 David Bowie’s visual art and imagination is also on great display on his many pop videos - most of which can be found on the two-disc ’Best of Bowie’ compilation. The Bowie Brixton Mural Memorial! I thought I would end this piece with one of the great commemorative symbols of these last few months. Australian street artist James Cochran’s (JimmyC) wall painting from June 2013. The artwork is now protected as a listed work, and can be found on the side-wall of Morley’s Department Store on Tunstal Road, just around the corner from 172 Brixton Road, SW9 8EH.